Born and raised in Japan I enjoyed a fair share of origami just like most Japanese children, but I had forgotten about it as I grew older. It is only since 2006 that I started folding paper again, while teaching school aged children. My interest in origami grew over the years since then, and it eventually became my main subject to teach, and my passion. I live in Portland, Oregon and teach at local schools, libraries, camps, elder care facilities, correctional facilities, and at special events. I have taught a wide age range of people from pre-school and school aged children, teens, adults, seniors, as well as in multi-age and intergenerational settings. I love promoting this form of art that can be enjoyed by a wide variety of people. Photo by Jon Richardson at Portland Art Museum in 2018. 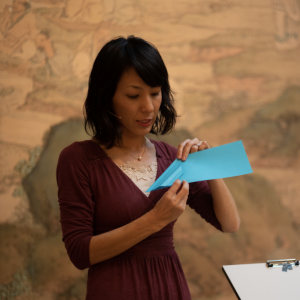 Portland Art Museum – demonstration, workshop and display in Japanese Poetry, Art & Culture Weekend events, in conjunction with Poetic Imagination in Japanese Art exhibit, 2018 and 2019. I am also an author of Super Cute Origami Kit: Kawaii Paper Projects You Can Decorate in Thousands of Ways! from Tuttle Publishing. In addition, I am a member of the American national origami society, OrigamiUSA. I occasionally write on its magazine and attend its conventions. I am also a member of Portland’s local origami group, Portland Oregon Paper Shapers, and regularly attend their monthly meetings. I love exploring new folding techniques and connecting with fellow origami enthusiasts, near and far.